I finally found my first sidewalk decoration of interest in the new neighborhood. 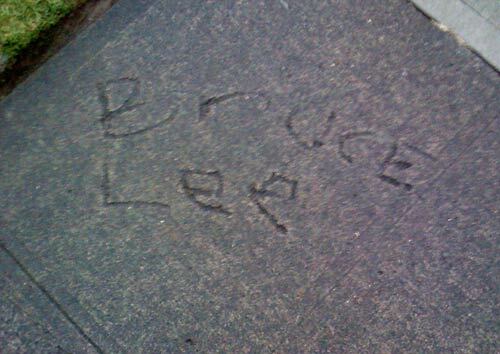 I’ve been looking, but haven’t been able to find any misspellings, and judging from how few concrete stamps there are, most of the neighborhood must have been done by the same contractor. Anyway, this gem is a few blocks my my place, and I took it back when it was light in the morning. The age of the cement suggests that was drawn in at the master’s height, if not shortly thereafter. I can almost picture the scenerio in my head. Some kid just finished watching Enter the Dragon and was outside playing with his nun-chucks and saw wet cement. The clouds probably even parted and a ray of sunlight lit up the sidewalk, calling out to young Billy. Luckily, Billy knew who to immortalize. Good choice, Billy.